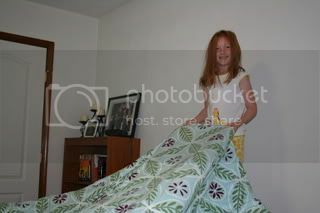 It may be due to OCD issues but Syd is obsessed with making her bed. This too shall pass, so while she's into it, I've been encouraging her and Brenna to make not only their beds, but whatever beds need making. 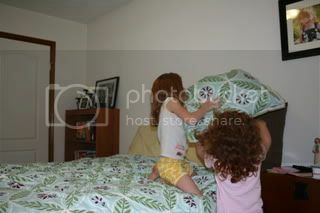 They pull up the sheets and covers. And pile on the pillows. And nothing is very smooth or picture worthy very often, but the point is, they're doing it. Even super littles can help with beds! 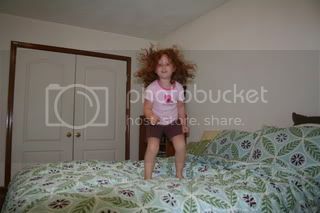 While you're at it, you should always do a little jumping as long as it's not an antique or fragile bed. Jumping (one at a time) is pretty safe, in my experience. Sometimes I think we say no too much. And apparently next up... haircuts! I love your pics...looks like you guys are having a great time! That looks so fun!!! I was just feeling guilty that I don't let my kids jump on the bed... then remembered bunk beds aren't too great to jump on. Hit the road -- err, the driveway!